In the end it was the leadership of the Clerk of Session, Eleanor Warren, and the determination of the session itself that dictated Hanover’s future. There would be no merger. Hanover Street Presbyterian Church would remain at 18th and Baynard. There were challenges, but none that couldn’t be overcome by faith and hard work. The congregation felt it had the power, even without a pastor, to persevere in the face of adversity. In 1983 Hanover called Robert Undercuffler as pastor of the church. Rev. Undercuffler was a friendly man who created a warm church environment and welcomed all types of people for worship at Hanover. Younger people, many with no previous church affiliation, began to attend services. Drawn not by geography, these new members came because they heard about the mission and work of this particular church. He was joined in 1984 by Associate Pastor Kate Jeffress, who was called specifically to develop a neighborhood ministry. She was the first female pastor on the Hanover staff, and her selection was also in part a recognition of the changes that had been occurring in society and in the church since the women’s movement had begun 15 years earlier. One of the first initiatives was Advance — an effort to address community concerns through the work of a church and its congregation. Issues such as the use of illegal drugs on public schools were addressed with much vigor, and while not all projects were successful, they helped build the confidence of the congregation. It was during this period that the changing composition of the congregation began to be felt. Younger members and neighborhood members, African-American and Caucasian, felt free to air their concerns and develop initiatives that improved the life of the church. The first African-American Elder was ordained in 1985, and others followed shortly. The concerns of gays and lesbians took center stage as the congregation opened its mind to include many types of families, with many types of lifestyles, into Hanover’s greater family. A More Light congregation began to meet at Hanover. These services were designed to meet the needs of gay and lesbian worshippers who found the traditional worship service too threatening or confining. These struggles did not come without a significant cost. Some members were uncomfortable with the changes and voiced their concerns in public and private. Others felt that this new, inclusive congregation ran counter to the teachings of the church. Some left, in sorrow or in anger, and some who left eventually returned. More than anything else, these struggles caused members to contemplate what it meant to be a responsible Presbyterian disciple. The clergy were often caught in the middle of these challenging times. In the end, the pressure of a church in transition, combined with the struggles of living their own lives in a complicated world, hastened the resignation of Rev. Jeffress and later Rev. Undercuffler. New mission initiatives were forming as the congregation welcomed William C. Goettler as its new pastor in 1988. Bill brought new ideas for the worship hour and a renewed sense of pastoral energy to a congregation ready continue its journey of faith. The congregation took on two of society’s most pressing issues during those later years of the 1980s — homelessness and the lack of affordable child care within the community. One of the results of the Advance project’s conversations with Hanover’s neighbors had been the realization that services for children were a priority. The Jefferson Street Child Center, a partnership of Hanover and the Southeast Ninth Ward Neighborhood Association, was formed, and work began which eventually led to the establishment of a child-care center in the Christian Education building. The center was originally run by the YMCA. When the YMCA dropped out for financial reasons, the congregation and the neighborhood association incorporated the JSCC as a nonprofit organization designed to enrich the lives of young people and their families, regardless of their ability to pay. The early years were a struggle, but as of this writing the center operates with increasing support from the neighborhood and an ever widening constituency base. A house was purchased on the East Side of Wilmington to be renovated and sold to a worthy family making the transition from rented space to a home of their own. Through the “sweat equity” of the congregation, and the leadership of several key volunteers, the house was completed and ready for the market. Hanover quickly learned of the challenges facing those seeking housing and those trying to provide it at the most reasonable cost. After dealing with mountains of red tape and seeing tenant after tenant abuse, vandalize and destroy the property, the house eventually found its place in the community by becoming part of the Churches Take a Corner (CTAC) organization. The house now serves the needs of those facing the dangers of substance abuse. Rev. Goettler’s leadership helped to continue Hanover’s march toward a more diverse, inclusive organization. The addition of Co-Pastor Maria LaSala in 1991 created a ministerial partnership — an unusual husband-wife partnership — that would serve the congregation in new and exciting ways. The study of Feminist Theology became an important part of the life of the church for many participants as new ways of reading the Bible became apparent through the eyes of our sisters in faith. Special worship services were held that reflected the many ways that a diverse community could celebrate God’s glory. The addition in 1994 of Patrick Evans, a University of Delaware voice professor, as music director helped this new sense of inclusiveness find a voice at Hanover. 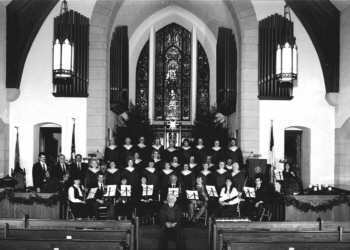 Traditional Presbyterian hymns and anthems were mixed with African, Caribbean and contemporary music in a way that allowed the congregation to worship in new and exciting ways. The demographics continued to shift throughout the 1990s as the Sunday school program grew from a handful of children to classrooms filled with activity. Once again a church that had made a name for itself 175 year earlier by its cocern for the education of the young was nurturing a new generation. A snapshot of Hanover Presbyterian Church as it reaches its 225th anniversary would capture a congregation always in motion. In January 1997 a capital renovation campaign, chaired by Eleanor Warren, was launched to improve the experience of worship, increase the accessibility of the sanctuary, renovate the gymnasium and modernize the kitchen. The members of the church responded by pledging more than $240,000 toward these improvements — exceeding the $225,000 goal and preparing the building for the next century. An additional $100,000 was raised by the Jefferson Street Child Center to allow a more complete renovation of the gymnasium. More important than the state of the physical plant is the continuing growth of the attendance, membership and involvement of congregation. The diversity of a typical new members’ class increasingly reflects the variety of family structures seeking to live a faithful life, and the number of congregationally-driven programs and activities reflects the interests and passions of the church community. Christian education classes designed to celebrate diversity and eliminate racism, are interchanged with sessions outlining the foundations of the Presbyterian faith. Men and women, children and adults, the distinguished and the disadvantaged work side by side in mission projects, find themselves seated together in worship, and break bread together, striving to continue the legacy of worship, service and faith that defines Hanover Street Presbyterian Church.